Like many people, I have been thoroughly enjoying this year’s World Cup in Brazil. So far, it has been the tournament that we always wish for but never get: there have been surprises (Spain – twice) and lots of great goals. Most of the good players are living up to the pre-tournament hype, and, strangest of all, the English media is displaying a realistic sense of their team’s potential (for now anyway). Let’s hope it continues for the next few weeks – even if the 11.00 matches are slightly exhausting. I’ve heard a few people say that it’s a pity Ireland aren’t at the World Cup, and of course that is true in some ways. Having said that, the style of play evident over the last week has displayed all of the virtues that the Irish team currently lacks: speed of thought, technical ability, imagination, confidence. The team would not have fared well at this tournament, I think. In thinking about Ireland’s absence from the World Cup, I found myself being reminded that there is one area in which Ireland retains some sort of international prominence – I’m talking, of course, about our theatre – or literature from this country more generally. There is one great example of that prominence in Brazil, which is the existence of the company Cia Ludens. 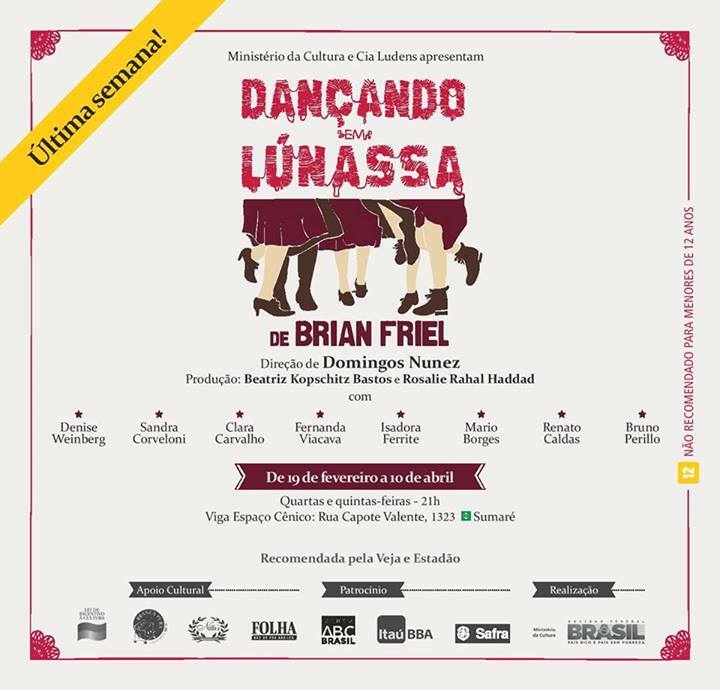 Based in São Paulo, this professional company was established in 2003 with the remit of translating and staging Irish plays, starting with a well regarded version of Dancing at Lughnasa in 2003 which was recently revived. but it was only in 2003, while in Ireland researching for my PhD thesis, that, through the critical works of Stewart Parker, I approached Huizinga’s idea of ludo ergo sum in a more revealing way. Parker, interpreting Huizinga, affirms that “play is how we test the world and register its realities. Play is how we experiment, imagine, invent and move forward” (6). This movement accurately reflected the innermost feelings of the people who happened to be part of the company at that time, and Ludens seemed the precise term to signal our deepest intentions in dealing with Irish and Brazilian contexts through the perspective of drama. The Latin term led us to make associations with other rich words that could be used as fruitful possibilities on the stage, such as the Latin ludo, inlusio and illudere; the Portuguese lúdico and ludibriar, and the English ludicrous and illusion. Nunez has a very stimulating account of how the company’s approach draws on ideas not only from Huizinga but also from Boal, Stanislavski, Brecht and Lehmann. It is rooted in Irish drama, but it draws freely on an amazing range of international contexts. Of particular interest is a production that the company staged of Tom Murphy’s Bailegangaire and A Thief of A Christmas. Both plays were originally performed in 1985, the former by Druid and the latter at the Abbey – and both tell the same story from different perspectives. In Bailegangare, Mommo tells the story of how a town called Bochtan was re-named Bailegangaire (the town without laughter) as a result of a laughing competition that her husband participated in. Thief of a Christmas actually stages the laughing contest, and makes explicit Mommo’s culpability for what happens in it. Seeing Cia Ludens’s rehearsal of the play I realised how profoundly the director, Domingos Nunez, had penetrated Murphy’s dramatic vision. For in his ‘transposition’ of the play to Brazil, and merging of Mommo’s memories in “Bailegangaire” with her lived experiences from “A Thief of a Christmas”, Mommo does more than tell the story. In this production she inhabits it – or rather it inhabits her, and she lives more fully in that world of the past than she does in the present where she only fitfully recognises her granddaughters. In staging the play as Mommo’s ever-present nightmare we see her slow progress to Bochtan and inability to leave, for to continue her journey home would be to acknowledge the events which faced her there, events for which she feels responsible. As her granddaughter, Dolly, says, ‘She’s guilty.’ This is the fact which must be faced. What is notable about these works is that Nunez and his company are not staging productions that are in any way derivative of the original Irish versions. The Irish works are transposed to Brazil, re-imagined, and thoroughly re-inhabited. The kinds of choices made about staging and performance draw on many of the approaches used in Ireland, from naturalism to post-dramatic theatre – yet they are also distinctive. I would love to see Cia Ludens performing in Ireland (ideally in Galway, where there remains a strong Brazilian community). I feel that we could learn a huge amount from these kinds of exchanges. In the broader context in south America, there are lots of other interesting projects underway. Only recently, I heard from Charlotte Headrick (an American scholar who works on Patricia Burke Brogan’s plays) that Brogan’s Eclipsed was recently staged in Peru. That play is one of the first attempts in Ireland to come to terms with the tragedy of the Magdelene Laundries – and it was given a terrific production by Mephisto theatre company here in Galway last year (I blogged about it at the time). Ireland and Peru are of course very different from each other. But it is sickeningly unsurprising that Brogan’s story has proven resonant with the experiences of people in another “Catholic” country. About fifteen years ago, there was a definite shift in the academic study of Irish theatre: scholars moved from writing about plays they had read (focusing on themes, characterization and other broadly literary elements of the script) to instead analysing performances that they had seen. As a result, an Irish theatre conference is now just as likely to host papers about theatre-makers – from Garry Hynes to Joe Vanek to Louise Lowe and beyond – as it is to include papers about Irish dramatists. This is certainly a positive development, but it is notable that we have tended mainly to explore Irish theatre as it is staged in Ireland. We tend to have some awareness of the Irish theatre companies that stage work in America (groups like PICT or the Irish Rep among many others), or in the UK (the Tricycle, for example). But I think there’s a very poor awareness of how, when and why Irish theatre is staged outside of the Anglophone contexts – especially outside of Europe. A group I’m involved in called the Irish Theatrical Diaspora project was set up 10 years ago to try to track some of this work – and I think that in our second decade we need to do much more to engage with work in places like Brazil. We hear much about the importance of the work that Culture Ireland has done in bringing theatre from Ireland to other countries. Yet groups such as Cia Ludens are also doing this work, and perhaps do more to facilitate a genuine intercultural dialogue between Irish culture and other forms of culture. The translation of Irish plays from English into other languages is important – and is brilliantly supported by ILE. But the subsequent staging of those plays is another form of “translation” that has a lot to teach us about our theatre and our country. Of course, for a dialogue to happen, both parties need to listen to each other. I’d hope that in the years ahead, we can find more opportunities to bring companies like Cia Ludens to Ireland, so that we can – perhaps – start to re-conceive Irish theatre in a more international context. Just as football was an English game that the rest of the world imported and then made its own, perhaps “Irish theatre” can similarly be seen as something that is staged in Ireland – but staged everywhere else too, often in ways that are very exciting. And those stagings can in turn be brought back here, re-invigorating, renewing and challenging our theatre practice. This entry was posted in Irish theatre and tagged Brian Friel, Cia Ludens, Tom Murphy. Bookmark the permalink.